Electric polarization is a macroscopic quantity which describes the dipole moment of matter. The polarization originates from the peculiar electron distribution at the atomic scale in polar and ionic materials, among them the most interesting class of ferroelectrics. Their spontaneous electric polarization is widely applied in electronic sensors, memories, and switching devices. The link between polarizations, in particular time dependent ones, and microscopic electron densities is important for understanding and tailoring the properties of ferroelectrics. 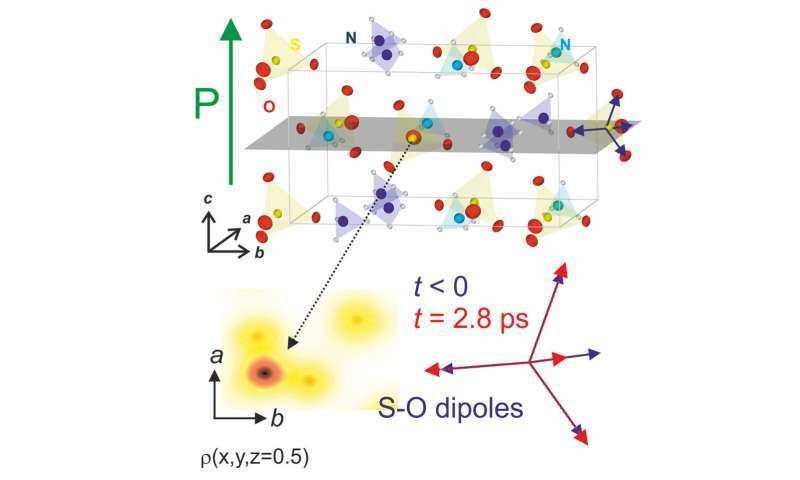 The theoretical work extends the existing quantum phase approach for calculating stationary macroscopic polarizations towards ultrafast nonequilibrium dynamics of electron charge and polarization. The theoretical key steps consist in deriving a microscopic current density from time-dependent electron density maps while minimizing the electron kinetic energy, and calculating the macroscopic polarization from the current density. This method is applied to the prototype ferroelectric material ammonium sulfate [(NH4)2SO4, Fig. 1] with the time dependent electron and current densities shown in the movie. As a second prototype system, potassium dihydrogen phosphate [KH2PO4] was investigated. The analysis provides macroscopic polarizations and their absolute values as governed by microscopic vibrations. The results establish ultrafast X-ray diffraction as a unique tool for grasping macroscopic electric properties of complex materials. The broad relevance of this new insight is underlined by the selection of the article as an Editor's Suggestion.